Can SRI be a means to make investors both virtuous and prosperous? This paper argues that there can be significant tensions between these goals, and that SRI (and indeed all investment) should not allow the pursuit of maximizing investment returns to prevail over an ethical agenda of promoting social and economic justice and environmental protection. The discourse on SRI has changed dramatically in recent years to the point where its capacity to promote social emancipation, sustainable development and other ethical goals is in jeopardy. Historically, SRI was a boutique sector of the market dominated by religious-based investors who sought to invest in accordance with the tenets of their faith. From the early 1970s, the aspirations of the SRI movement morphed significantly in the context of the divestment campaign against South Africa’s apartheid regime. No longer were social investors satisfied with just avoiding profit from immoral activities; instead, they also sought to change the behavior of others. Business case SRI is a problematic SRI benchmark for several reasons: often there is a countervailing business case for financing irresponsible activities, given the failure of markets to capture all social and environmental externalities; secondly, even if investors care about such concerns, there may be no means of financially quantifying their significance for investment purposes; and, thirdly, even if such factors can be financially quantified, they may be deemed to be such long-term financial costs or benefits that they become discounted and ignored. The ethics case for SRI and ethical business practices more generally takes the view that both investors and the companies they fund have ethical responsibilities that trump the pursuit of profit maximization. Ethical investment should be grounded on this foundation. However, it may not be enough. 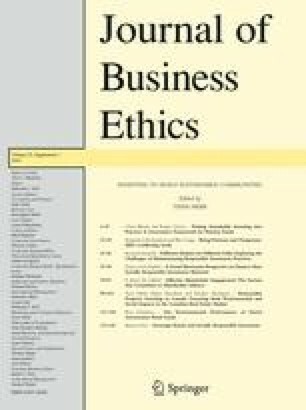 To keep ethical investment ethical will likely require institutionalizing new norms and governance standards, in such domains as reforming fiduciary duties and the internal governance of financial organizations. SRI’s own codes of conduct including the UNPRI have yet to demonstrate the robustness to move the financial community beyond business as usual. Global Reporting Initiative (GRI): 2010, ‘G3 Guidelines’, http://www.globalreporting.org/ReportingFramework/G3Guidelines. International Organization for Standardization (ISO): 2010, ‘About ISO Social Responsibility’, http://isotc.iso.org/livelink/livelink/fetch/2000/2122/830949/3934883/3935096/07_gen_info/aboutStd.html. Union of Concerned Scientists: 1992, ‘World Scientists’ Warning to Humanity’, http://www.ucsusa.org/ucs/about/1992-world-scientists-warning-to-humanity.html.